Today we present debut author, A.E. Conran whose book, THE LOST CELT will be released this March! Don't forget to enter to win a signed copy of her book. Tell us about yourself and how you came to write for young people. I was born and raised in England and moved to the U.S. 18 years ago. When I was a child I was convinced I was going to be a writer. I was going to live in a beautiful thatched cottage in our village and write children’s books. When I was 17 or 18, my family actually moved into the very house I’d dreamed about, but I never wrote books there. In fact, even though I studied English as an undergraduate and postgraduate, I didn’t write anything until about 15 years ago. Its sounds strange, but I just didn't have anything to say. Instead, I worked as a copy editor for magazines and then as a Human Resources consultant and sort of lost my dream…until I had kids of my own. I threw myself into being a mum, but when my son was about four years old my husband very wisely said…I don’t want you to find that the kids suddenly go to school, or leave home, and you’ve done nothing else with your life. We saw a cartoon in which a woman walked around feeling she’d not achieved anything and whining, “I’m wasted!” Pat didn’t want me to be walking around our house saying, “I’m wasted,” as much for his sanity as mine. It was a good call. I thought long and hard about my childhood dreams. I really believe that the thing you wanted to be when you were around 12 is tapping into your true self. For me, that was being a writer. Once I had given myself permission to do it, I found I had lots of things to write about, in fact far too many. I’ve never wanted to write for any other audience but children. I vividly remember the very moment that I fell in love with reading. It was at the library in my father’s teacher training college and the book was THE LION, THE WITCH, AND THE WARDROBE. I remember everything about that moment, the motes of dust in the rays of sunlight through the window, me kneeling on the floor not moving until the book was done, the light crossing the floor as the sun appeared to move around me. I fervently believe that the books you read when you’re a middle grader don’t just change you, they become you. They sink deep into your psyche. This is a great responsibility for the writer, but also a great relief, because if you tap into that ‘compost or leaf mold’ as my agent Sarah Davies says…the ideas are all there. You work at an independent bookstore, The Book Passage, in California. How has that job influenced your writing career? It’s been a tremendous help, as well as a complete joy working with some of the nicest and most knowledgeable people imaginable. 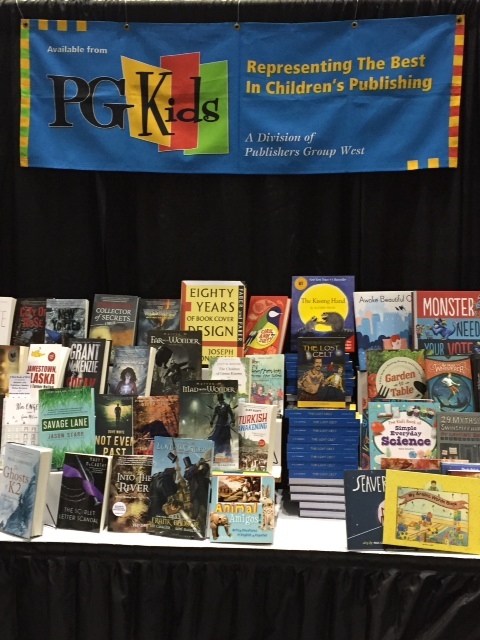 As the School Book Fair presenter, I get the rare pleasure of going into schools and talking about my favorite books to class after class of K through 8 kids. It means I see at first hand how kids react to a great premise or a good hook. That has definitely changed the way I look at initial ideas and plot structures. I also host four children’s book clubs. Young readers are incredibly sophisticated. They have a natural sense of story and character, they’re not afraid to go to crazy places in their imagination and they love to laugh. They already know the ingredients of a good children’s book, and I’m still trying to throw caution to the wind and get back to that point. Paradoxically, working in a bookstore has given me great insights into the entire publishing and selling process, but it has also made me realize that being a children’s book author is not about the publishing. 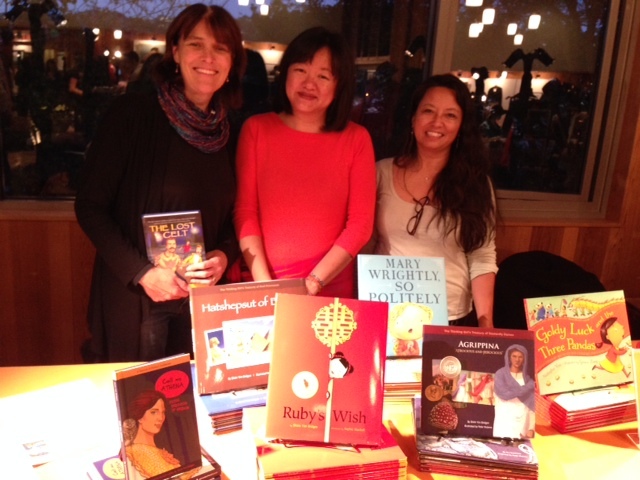 I’ve seen firsthand how generous and passionate visiting children’s writers can be. The greatest authors are writing because they have stories in their heads, not because they want to be published. They believe in the transformative power of story maybe because they have seen it, or relied on it at times in their own lives. A “true” story will take off far beyond the expectations of the author. It will take flight on its own. Congratulations on your debut, THE LOST CELT (by Gosling Press). Tell us about it and what inspired this story? 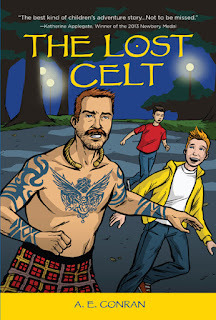 The Lost Celt is a middle grade adventure story. Fourth Graders Mikey and Kyler are convinced that they've seen a real live Celtic warrior transported to the present as part of a secret defense project. If they track him down, they're sure to reveal the secrets of time-travel once and for all, and write the best Veteran's Day report in the history of fourth grade reports in the process. Instead, they discover a different secret: the invisible effects of war on veterans of all generations and their families and the transcendent power of friendship. 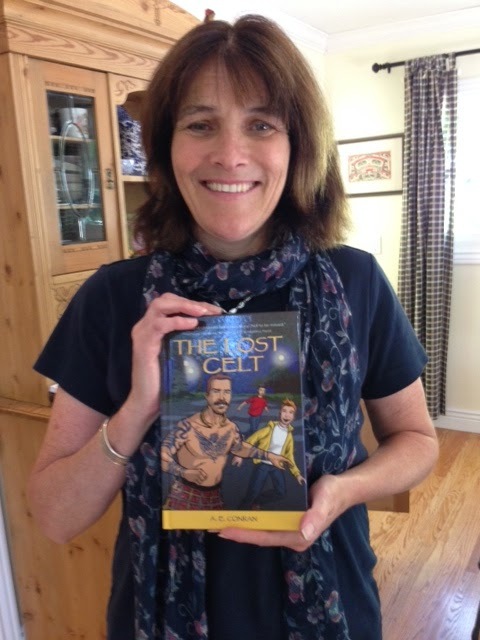 I have always had a love of Roman and Celtic history in the British Isles and a desire to time travel. As a child I painted tiny Roman and Celtic soldiers and visited historic sites across the UK including walking Hadrian’s Wall. I was at Vindolanda, a Roman fort, the day they discovered a Roman sandal. I watched them unearth it. I loved historical fiction especially the works of Rosemary Sutcliffe and Henry Treece, as well as the Greek classics like Homer. So many of these were stories, often based on ancient stories, about living through, and returning from, war. 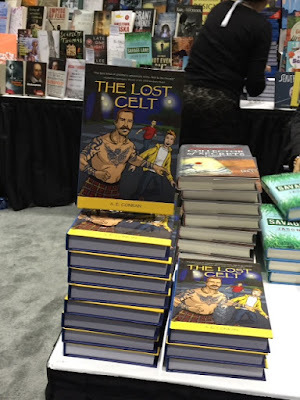 THE LOST CELT was inspired by a conversation with two friends, both emergency room doctors at the local VA Medical Center. They told me how there were always more admissions on “certain nights” when war stories or natural disasters were in the news. Something about that phrase and certain visuals stayed with me. At least four years later, I was actually stopped at a traffic light, when the idea for the book came to me. I had to pull over and write it all down before I lost it. The book has changed somewhat during revisions, but the germ of the story has remained the same. Why was I, a civilian, attracted to this story? This has worried me on occasions, but I can only say that there were many factors at play as I explored the idea for this book. I grew up in a small village in England where there were still veterans of the First World War, one of whom used to walk to the local pub in his medals, greatcoat, and puttees (strips of cloth that First World War soldiers wrapped around their calves). There were also veterans of the Second World War, and even a German Prisoner of War who stayed and worked on a local farm after the war ended. There was definitely a disconnect between my mother’s experience and my own upbringing and that of my friends. I think it was this that led me to make one of my main characters a veteran of a recent war. I hadn’t planned to, but as I listened to the news, I became very aware of a similar disconnect. It was apparent how deeply the wars in Iraq and Afghanistan were affecting a relatively small portion of our society. Unlike the experience of previous World Wars, it struck me how large a gap there was between those serving and their families, and those of us who were not. That did not feel right to me. I really hope this book closes that gap a little. I’m working on another war story. WWI and WWII stories are in the air right now, so I’d better hurry up. I started this story three years ago when there were no WWI stories out there for middle graders, apart from Michael Morpurgo’s brilliant books like BUTTERFLY LION and PRIVATE PEACEFUL, but he’s in a league of his own. The working title is MUDLARK and it deals with a boy near the Front in 1915 France. It draws inspiration from the letters of my husband’s Grandfather, Denis Conran, who was an officer in the 2nd Royal Munster Fusiliers. He took photographs of French village kids in support trenches, and pictures of trenches running through villages. I was intrigued by that and also by a memoir called OF THOSE WE LOVED by I. L. Read, of the Leicester regiment, my home county, who talks about the lives of the French villagers during the war. Can I pick your bookseller brain for a minute? What are the top few MG and YA books you have read recently? I have to say my reading has been seriously hampered of late by all my efforts to support the launch of my book, but I’ve just finished a debut MG novel, THE HOUR OF BEES, by Lindsay Eager. I loved the way she played with ideas of magical realism, dementia and storytelling, so we were always questioning what was real and what was fiction. I really enjoyed another debut, THE REMARKABLE JOURNEY OF CHARLIE PRICEe by Jennifer Maschari, which struck me as CRENSHAW meets CORALINE. Again there was an element of magical realism in dealing with the topic of grieving that I would definitely have been drawn to as a child. I’m captivated right now by the wonderful writing in WOLF HOLLOW by Lauren Wolk. The setting is so beautifully drawn that I feel as if I’m there. I sense the character’s love of the farm, the weather, the wildlife, her family, her friends and therefore her sense of foreboding and dread as all is threatened. I’m only a quarter of the way in, but, so far, it’s the best thing I’ve read in a long while. These are not new books, but I’ve just listened to PORT CHICAGO 50, by Steve Sheinkin, which should be mandatory reading for everyone and AFTER TUPAC AND D FOSTER by Jacqueline Woodson, who proves time and time again that it’s all about voice. I met you through the Better Books Marin Conference, put on by your critique group. 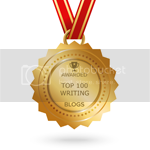 How important is a critique group to your writing? Incredibly important! It’s essential for me to have other writers modeling the constant persistence that we need to keep going in the “land of rejection.” We all go through similar stages of achievement and frustration and I have learned so much by observing the different stages of people’s careers and listening to their insights and advice. It’s particularly important to have people in the group who write and think differently to you. You need to be challenged, even if that can be uncomfortable at times. 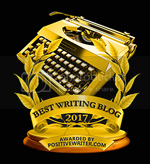 I’ve definitely developed a thicker skin over the years and a recognition that the best part of writing is not writing the first draft, but rewriting again and again. It’s taken me a long time to learn that while writing the first draft you’re merely heating the metal, in the furnace, into a blob. It’s the process of cooling off, then reheating reshaping and repeating the process where the skill really comes in. Your craft comes into play to shape your writing into your vision…or as close to it as you can get. Definitely join SCBWI and a critique group…and just read and write like crazy. If, as Malcolm Gladwell says, it takes 10,000 hours to get really proficient, start as soon as possible and enjoy all the time you have when you can write anything you want. How about three things because the one thing people who know me can all agree on is that I hate making decisions. So, I was in the Army Cadet Forces at school. I’ve done a catch on a flying trapeze and I’ve collected antique buttons since I was 6 years old. When A. E. Conran was Mikey’s age she had a tin of tiny Roman and Celtic warriors, which she never finished painting, and a desire to time travel, which remains with her still. A fan of historical fiction by Rosemary Sutcliff and Henry Treece, she also heard stories from her parents, grandparents, and their friends about living through, and returning from, war. In addition to writing middle grade novels, A. E. Conran works as a freelance editor, children’s book specialist and facilitator of four children’s book clubs at Book Passage in Corte Madera, including Ink (8-12s) in which the children have written and published their own fantasy, Dragon Mist. 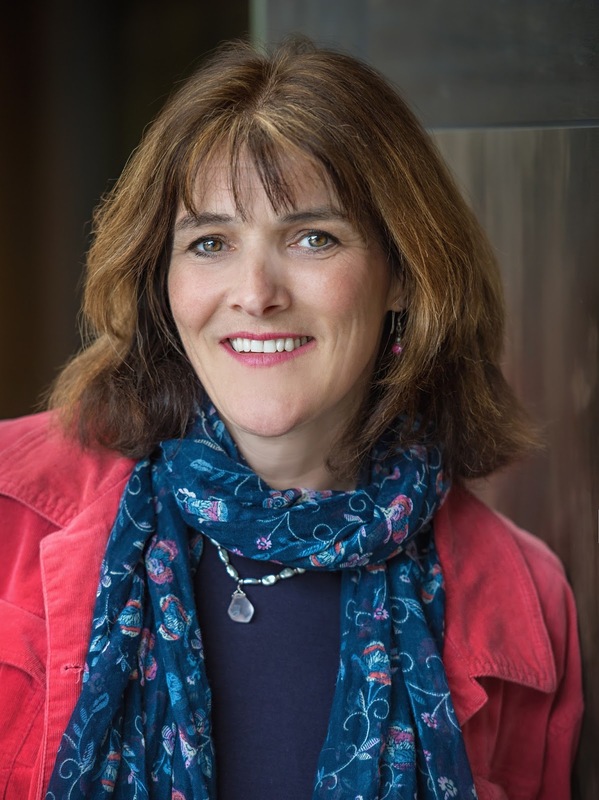 Amanda is a member of the Tuesday Night Writers group, which hosts the bi-monthly Pints and Prose Reading series in Fairfax, CA, and co-organizer with her critique group “M’Ladies” of Better Books Marin, a craft-based children’s book conference now in its fourth year. She lives with her family in Northern California. I loved reading about Amanda's experience and the story behind her story. It's always interesting to see how a person's life experiences (the people they've known or seen, their family, etc.) are woven into a book. It's good to hear I can tap into my compost for stories. :-) Congrats, Amanda! Well done, Amanda! Fascinating to read about her life and the genesis of her novel. Amanda is an amazing and natural storyteller of real life stories so I imagine her book is equally amazing and can't wait to read it! Sounds like a fascinating book. loved the interview - great advice as well. Look forward to reading this story! Love the heating the metal analogy, Amanda. Congrats on your book!